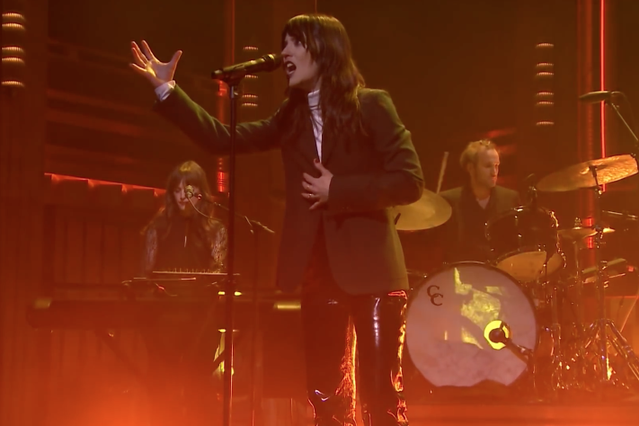 Sharon Van Etten has been making the TV rounds in the wake of her recent album Remind Me Tomorrow. Van Etten played “Seventeen” on Ellen last month; last night, she was the musical guest on The Tonight Show Starring Jimmy Fallon, where she performed her album’s lead single “Comeback Kid.” While musicians can tend to tone down their energy for late night TV performances, Van Etten cranks “Comeback Kid” up to 11 — it’s a looser, more vibrant rendition of the recorded version. Remind Me Tomorrow, Van Etten’s fifth studio album, was released back in January on Jagjaguwar. It marked her first new project since 2014’s Are We There, and followed an eventful five years for the singer-songwriter; in the interim, Van Etten returned to school, had a kid, and launched an acting career on Netflix’s The OA. She also appeared on David Lynch’s Twin Peaks: The Return. Remind Me Tomorrow is an expression of that productivity in spite of a tendency toward procrastination, and stands as one of 2019’s strongest musical statements. Van Etten is currently touring in support of the album, with shows running through mid-April. Watch Van Etten’s rendition of “Comeback Kid” on The Tonight Show Starring Jimmy Fallon below.